Lipp's KomBio reactors are made up of a digestion basin and a biogas storing ARGA. Unlike other anaerobic digestion systems, Lipp's KomBio reactors are made of stainless steel, which lengthens their lifespan. Their heating system consists of a network of high-energy transfer heating pipes located between the isolating panels and the metal wall. Since the heating pipes are never in contact with the corrosive substrates, the efficiency of this heat transfer is constant through the bioreactor's lifespan. KomBio Lipp reactors are composed of a digestion tank and a section that is used to store biogas. Unlike other anaerobic digestion systems, KomBio Lipp reactors are made of stainless steel, which increases their longevity. Their heating system consists of a network of heating pipes with a high level of energy transfer, which is located between the insulation and the metal wall. The efficiency of the heat transfer is therefore maintained throughout the life of the bioreactor, because the heating pipes are never in contact with the corrosive substrates. 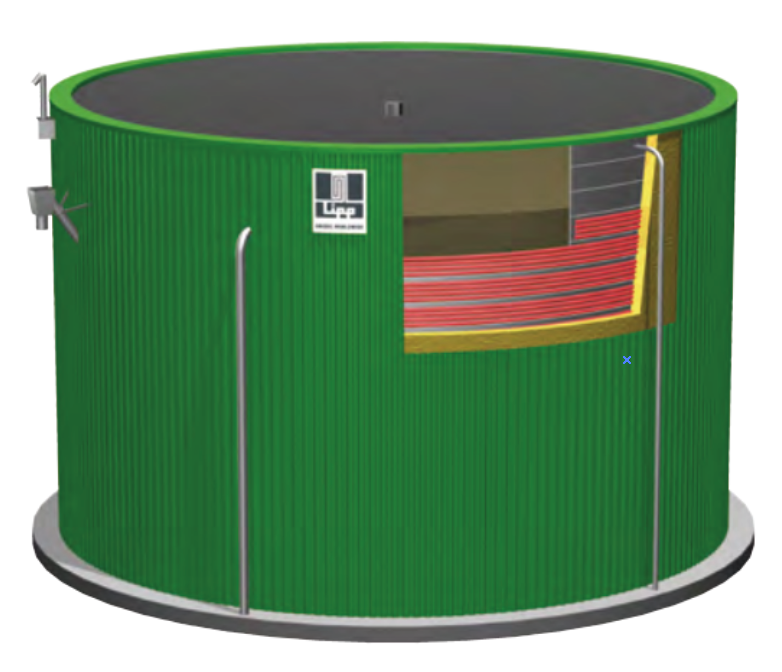 The assembly process, based on the “double-fold-system” principle of Lipp, allows a quick assembly of the anaerobic digester and ensures the tightness of the tank. In addition, the internal mixer of the anaerobic digester is disposed laterally to limit the mixtures up the digester. 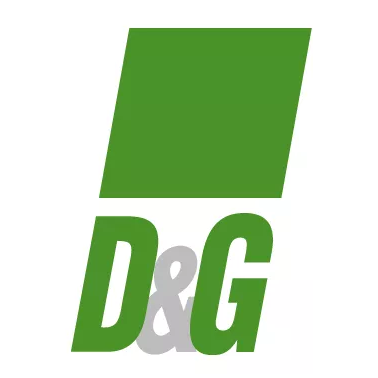 It is thus avoided that weakly digested substrates are removed during filling, which would require the use of a residual biogas recovery system outside the digestate tanks. By being placed on the side, the mixer can also be smaller. It is attached to the engine by a short drive shaft, making it a durable piece that requires the use of a more fuel-efficient engine. 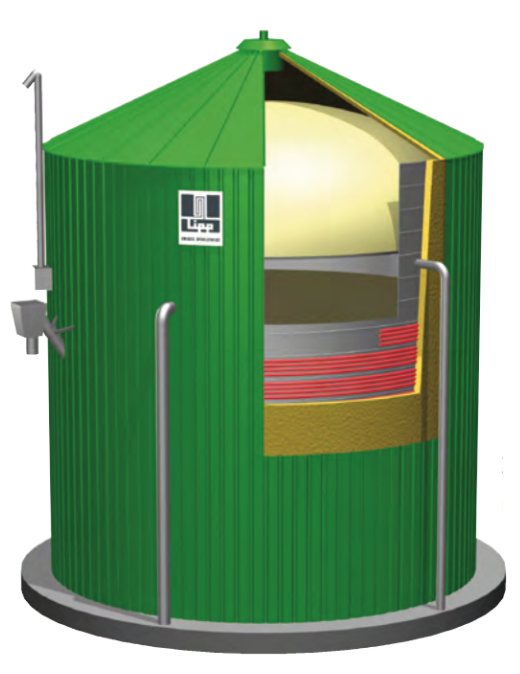 The KomBio LIPP reactor is an all-inclusive digester that includes brewing and heating systems, and an integrated biogas tank. They are offered in volumes ranging from 100m3 to 2500m3. This equipment allows an infinitely mixed wet process with high solids content. The universal fermenter adapts to all wet biomethanization processes according to the customer’s plant design. It can also be used as a hydrolyzer. They are offered in volumes ranging from 100m3 to 5000m3. The biogas tank is designed for activities requiring flexibility in the use of biogas. Highly secure, the LIPP atmospheric pressure gas supply is available in volumes ranging from 30m3 to 5000m3. To date, LIPP has manufactured more than 3,000 tanks worldwide for the storage of various solids, liquids and gases. 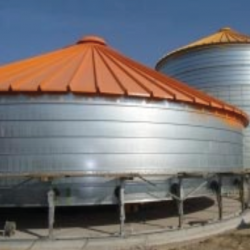 The volumes of the tanks vary from 40m3 to 10 000m3 and their diameter can vary from 3m to 50m. This equipment can reach a maximum height of 35m. Depending on the material stored, the tanks can withstand pHs from 3 to 13. The tanks are offered with a multitude of roof choices, from flexible roof to rigid stainless steel diaphragm. For more information, visit the Dominion & Grimm website.